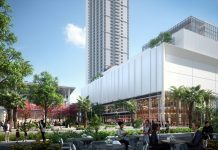 The Miami Urban Development Review Board has given approval to the Related Group to develop a triple tower project next door to the Adrienne Arsht Center for the Performing Arts. 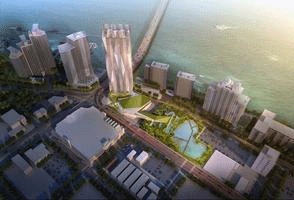 The development will rise on an L-shaped parcel at about 1400 Biscayne Blvd., MiamiToday reports. The mixed-use project includes 1,430 residences, a shared podium providing several layers of parking for 1,629 cars, and about 14,080 square feet of retail space spread among the three tower bases. Two towers are designed at 59 stories, and the third at 48. Miami-based architectural firm Arquitectonica designed the project to be called Auberge Residences & Spa Miami, Bernardo Fort-Brescia, founding principal of Arquitectonica, explained details of the project to the city’s Urban Development Review Board on Sept. 16. The site is bordered on the north by Northeast 15th St., and the west by Northeast Second Ave., MiamiToday reported. Melo Group‘s under-construction 36-story mixed-use residential Melody Tower takes up the remainder of the block, on the southwest corner.